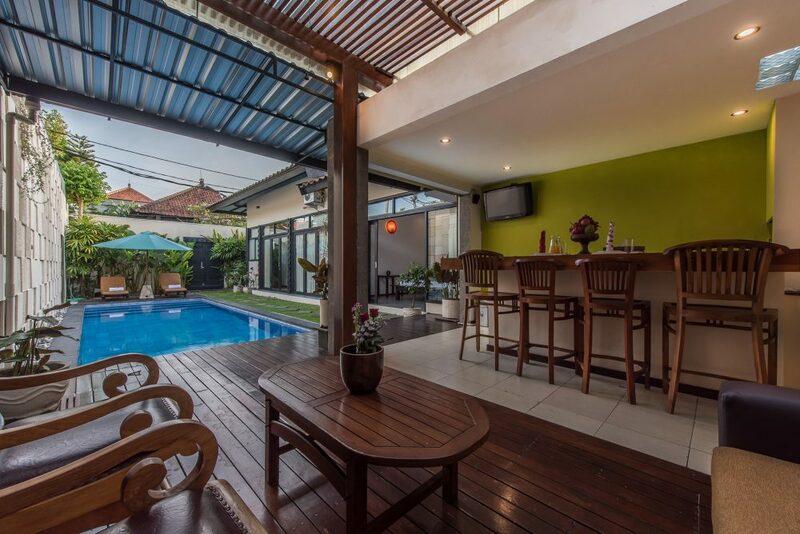 This pocket sized 2 bedroom villa is located in one of the most desired neighbourhoods in Seminyak, only 10 minutes stroll from the beach and 2 minutes from the culinary attractions of Eat Street. This property’s modest bedrooms are clean, modern and air conditioned plus guests can enjoy cooling off in a private pool after a day voyaging around the island’s sights. 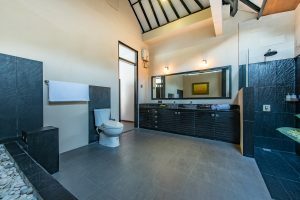 Villa Daria creates not only an affordable option for a family needing a break, it is also extremely versatile and can cater for larger parties. Adjoining doors in the garden wall link this villa to the 3 bedroom next door, creating a 5 bedroom property. Similarly, this villa can then be linked to the neighbouring 2 bedroom villa on the other side creating 4 bedrooms, or all 7 bedrooms can be utilised for really large parties. 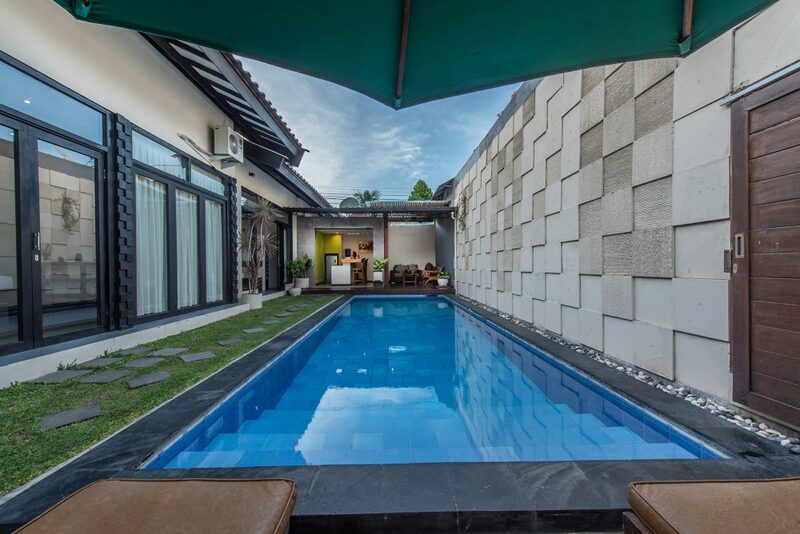 Entered via a door in the garden wall, guests immediately alight upon a small outdoor area highlighted by the clear waters of a swimming pool. At the far end of this space is the open plan, open to the elements living area. This comprises of a galley kitchenette which is furnished with all the appliances you might need but with all the great restaurants nearby, there really is no need to cook at all! Additionally, there is couple of comfortable chairs to one side, and a couple of sun loungers. 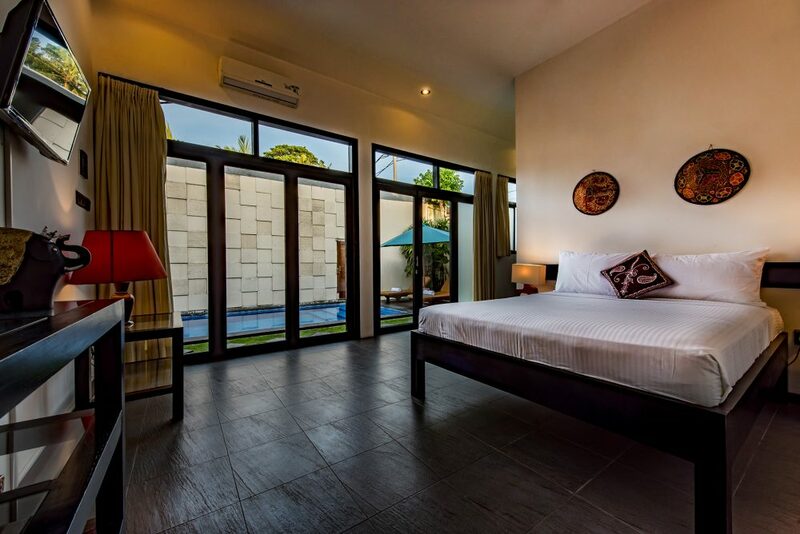 The two air-conditioned bedrooms are both well-appointed and simply furnished with double beds and flat screen TV’s. 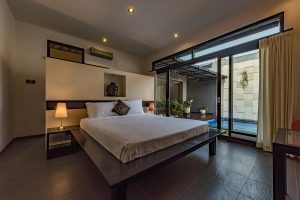 A comfortable night’s sleep is guaranteed as the villa is down a quiet lane meaning there is minimal traffic disturbance. 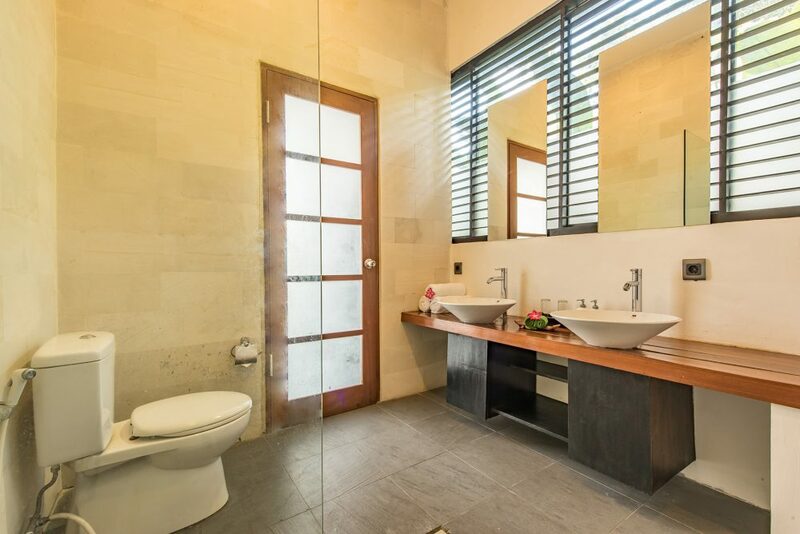 Both bedrooms have private ensuites with showers and vanity units. 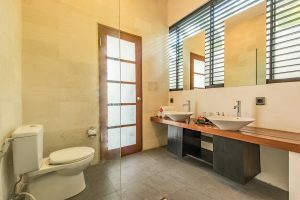 This villa complex has the advantage of being looked after by a villa manager and daily your holiday home is serviced by housekeeping. Additionally, gardeners and pool maintenance make sure your outdoor spaces are kept up to scratch. What this villa lacks in size and style, it makes up for ten fold in location and price. 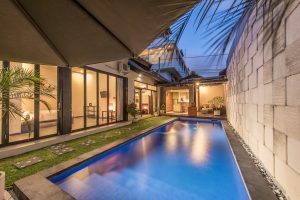 Situated on Jalan Drupadi, right near the junction with Eat Street, the cream of this districts shopping, eating and night life is right on your doorstep. Nearby hotspots for breakfast include Kilo, Corner House and Café Bali while the famed restaurant/ night spot La Favela is also within walking distance. 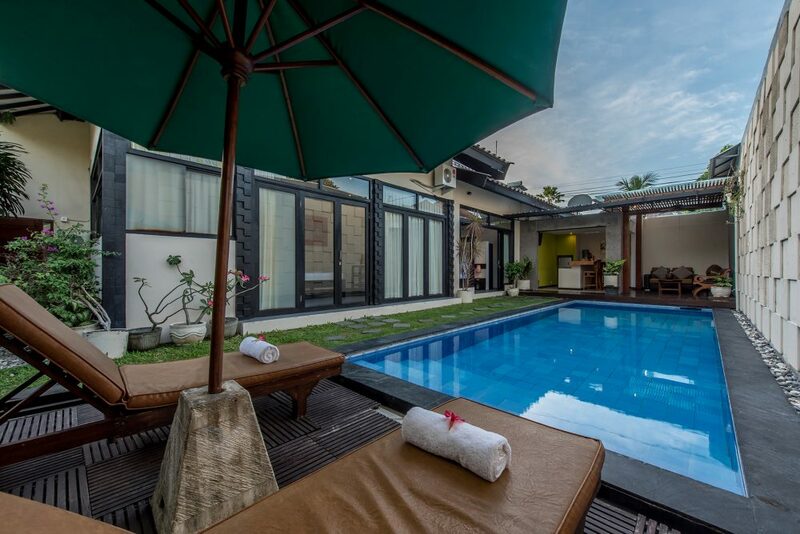 In the other direction from this villa, is Seminyak Beach. Along this stretch of sand, there are some fantastic, quirky beach bars with colourful beanbags, cocktails and tapas style food, perfect for relaxing and watching the infamous Bali sunsets that punctuate each leisurely day. For the more energetic guest, boogie boards can be hired or surf lessons taken, meaning that one more thing can be ticked off the bucket list. We stayed here for 4 nights in April 18 and it was fantastic. The staff are wonderful and available 24/7 if you need anything at all. 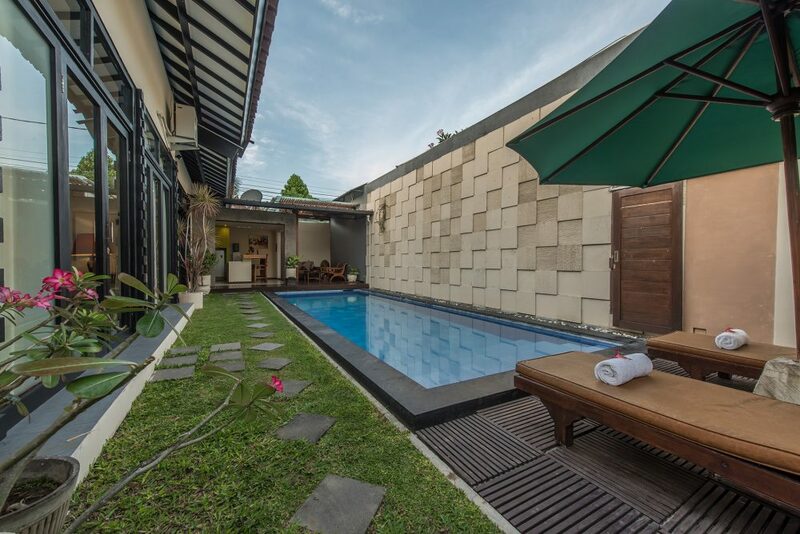 We loved the location being nice and quiet away from the chaos of people and traffic in town but still walking distance from the main street at Seminyak. The villa itself was absolutely stunning with the pool, big wooden double doors for entry, and beautiful garden features. Breakfast each morning was lovely, we would be asked what we wanted the next day and they will buy everything what is needed and the breakfast was ready the next day. The villa is also cleaned everyday when it suits you with a full bed change, pool cleaned and fresh towels etc. Overall a beautiful place to stay and highly recommended. Thank you to all the staff at Daria Villas!